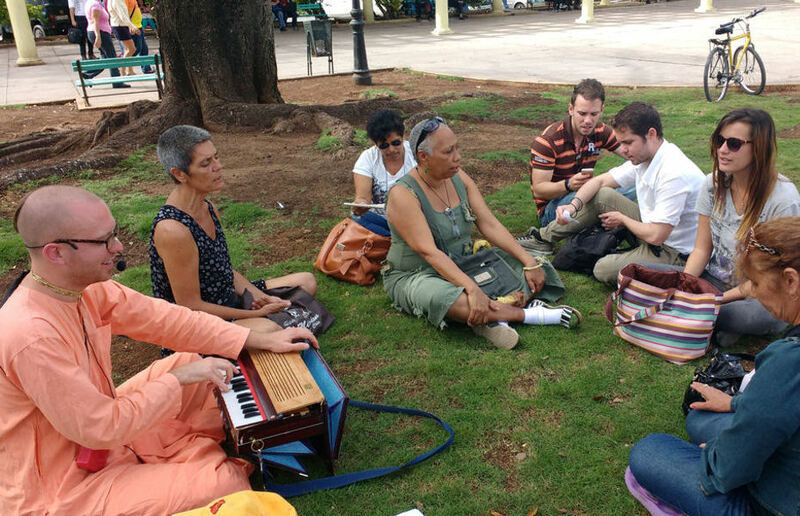 Hare Krishna Culture Growing in Cuba! ~ The Toronto Hare Krishna Temple! Hare Krishna Culture Growing in Cuba! Our Cuban journey is now finished. We were very privileged to be able to share Krishna Consciousness in Cuba. A few things we really appreciated about the Cubans is that they are very warm people, they are kindhearted and have quite a natural service attitude. We were able to do harinama (outdoor chanting and dancing) regularly, we organized around 40 programs, six retreats and distributed over 100 of Srila Prabhupada's books. One story: we were chanting in the "Plaza Central" in La Habana when one young girl (who had autism) came to us and started to dance ecstatically, smiling, with our Harinama Party. Her mother (in tears) came to us afterwards and shared that she never saw her daughter so happy in a very long time. Usually, her daughter is very introverted and neutral. Definitely, her soul was awakened by the irresistibly sweet sound of the kirtan! We really hope that you can one day visit the Cuban devotees. After all, we are the International Society for Krishna Consciousness! Namaste, is there an active ISKON temple/ community in Havana that I can visit? Thank you.